It's been a very busy few weeks -- fabric-related and other. The final episode of the major renovations to my living space and workspace is over at last. Construction throughout the rest of the building is still in progress, but I may finally unpack stuff that's been in boxes for quite a while and arrange things so that they make a little more sense. We'll see. I'll move slowly on this. And I may finally get some sewing in! It'll be one of a few projects I've been going over in my head for weeks, virtually sewing as I've shepherded the knitting of more wool fabric. I'm not exactly sure which project it is yet, but it's from my (Less) Cutting and (Less) Sewing board on Pinterest. I've been collecting these particular projects because they seem quick, rewarding, and are styles I love (at the moment). They're just what I need when sewing is scheduled in fits and starts. The added bonus is that they produce less waste. I'm seriously considering one of the sleeved scarf/wraps. It's a combination of a wrap with its crossover bodice and a cardigan with its front (or back) opening and sleeves. Not only do I think it will be fun to sew and easy to wear, but it will give me the chance to use my idea of a non-traditional self ribbing. The picture at the very top of this page is of the pieces I've used to test this self ribbing idea of mine. Below is the finished proto cuff. The fabric is Westerly. Though fancier than the typical rib, structurally it's still a rib fabric. You can see the wales (columns) of knit stitches on either side of the fabric. 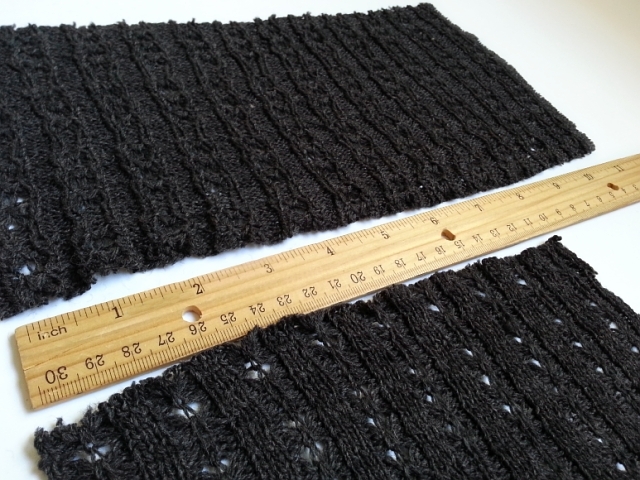 I chose the side with the most knit stitches, the technical face (See the "'Right' Side of Knit - Part 2".) 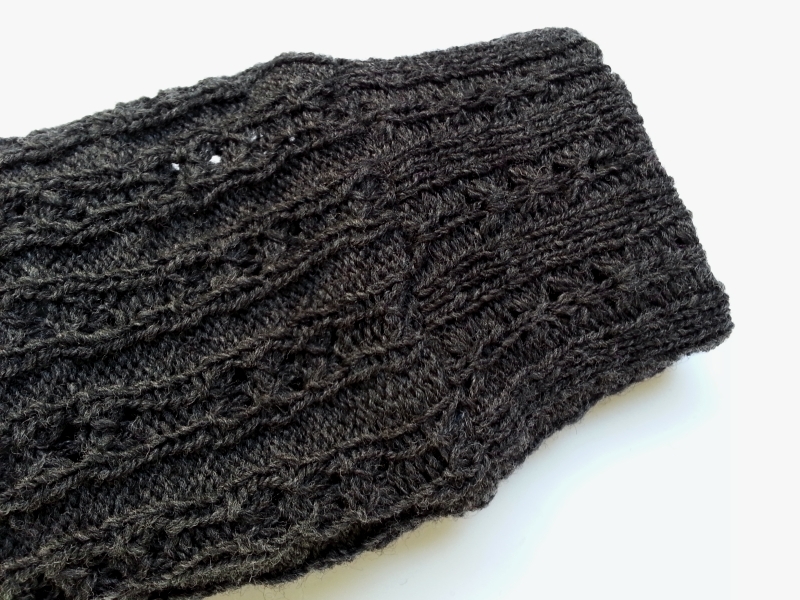 to act as my "ribbing" for the cuff. It's going to work for me. Now to choose my project!